Is anybody else swimming in chard this summer? A lovely spring is apparently steroidal to Swiss chard. My dad’s garden is overflowing and overflowing… and overflowing some more. Which is great! But what do you do with deep green and red-veined oceans of chard? You eat it! All the time. 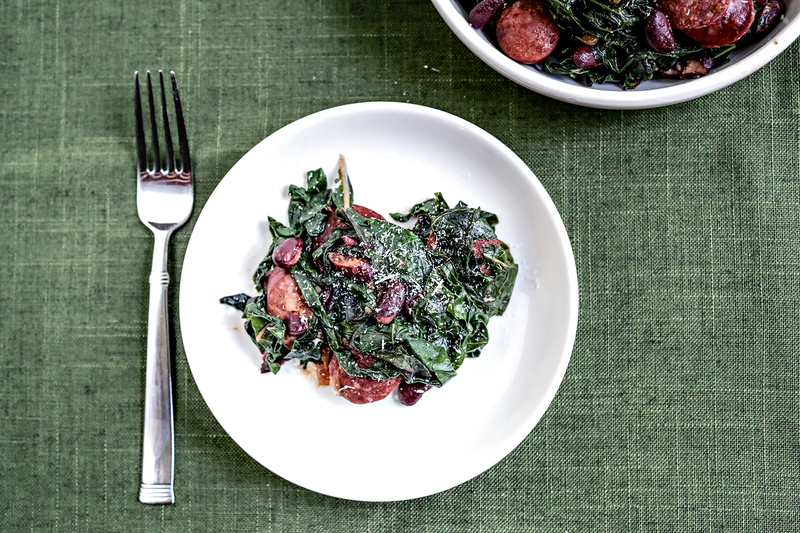 Luckily, once sautéed chard reduces quite a bit in volume so you want a lot of it. This recipe is a really quick throw-together, especially if your chard is washed, veined and ready to go. If you really don’t feel like stemming your chard, just cut off the tough bits at the end and leave the ribbing in. You will need to cook it about 10 minutes longer. You can use any combination of sausage and beans. Italian sausage and white beans would be good as well. I decided to go with smokey flavors and run with it, using smoked sausage and kicking it up a notch with smoked paprika. Smoked paprika is actually one of my favorite secret weapons in the spice cabinet. If you make sure to buy a sweet smoked paprika (instead of hot smoked, that will be very spicy), you can sprinkle away and add a really warm, but not spicy, flavor to any dish. It’s also useful if you’ve run out of cumin. The flavor profile is completely different, but the desired effect is the same. In a large skillet over medium-high heat, add the oil, onions, and smoked paprika and cook until the onions are translucent about 3-4 minutes. Add the garlic and cook another minute or two. Then, add the sliced sausage and cook until they are warmed through and starting to brown, about 7 minutes. Add the beans and stir to combine. Add half the chard with 1 T of water and cover. Keep covered until the chard has wilted and reduced in volume. Repeat with the remaining chard. You may have to do this in 2-3 batches. Once all the chard has wilted, toss to combine and serve hot. Sprinkle with grated parmesan. Non-venison substitution: Use any sausage! Vegetarian substitution: Omit the meat. 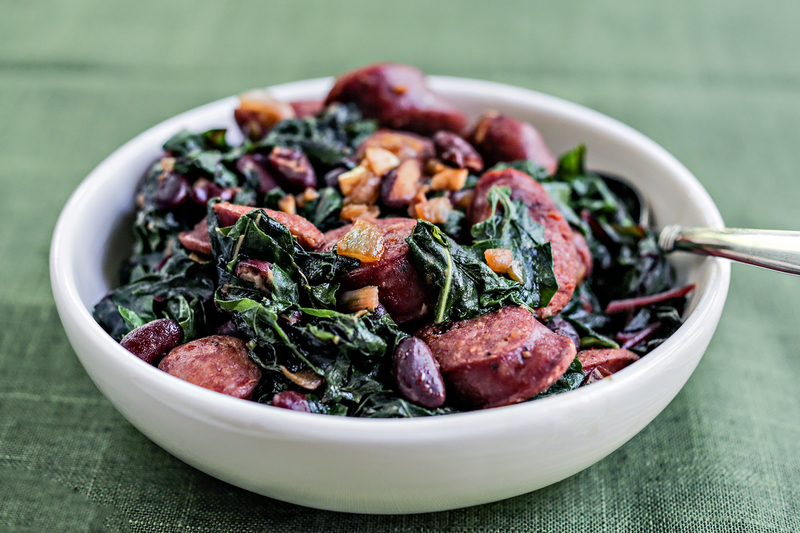 Beans and chard are great on their own!